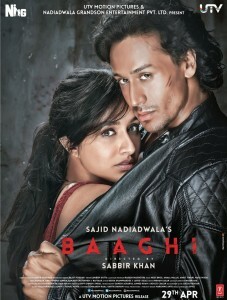 BAAGHI is about a rebellious, angry twenty three year old Ronny who is sent to a disciplinary academy by his father. On the way to the academy he meets Siya and she possess the same rebellious personality and they hit it off instantly. Ronny is falling in love with Siya, but so is his enemy at the academy, Raghav. Years later Siya is abducted and Ronny is brought in to rescue Siya from a dangerous area of Thailand. Will Ronny’s love and determination save Siya from the merciless Raghav? BAAGHI is Sabir Khan’s third feature film he’s directed. His directing skills capturing action, drama, and scenery entertains audiences and has Khan emerging as a top Bollywood director. Khan thrives on giving cast and crew opportunities and in return he expects hard work and he’ll assist anyway he can to help improve all involved with his films. The movie stars India’s rising star Tiger Shroff, who went through extensive martial arts training in preparation for his role as Ronny. This will be Shroff’s second feature film and he’s currently working on his next movie, A FLYING JATT. Shroff’s performance was highly regarded in his first film HEROPANTI and he knows the expectations have been set high for him in BAAGHI. Shroff welcomes the challenge as he put his heart and soul into the movie and audiences will be thrilled with his performance. Another reason audiences will be thrilled is that Bollywood’s beloved, award winning actress Shraddha Kapoor also stars in the movie. Kapoor is adored by fans for her multi talents, kindness, family values, and stellar acting performances. Generally she is a shy person, but you’d never know when you see her acting in her action, crime, comedy, romance, and musicals. Check out her fan pages including Facebook, Twitter, and Instagram, on each site search ShraddahKappoor. BAAGHI: A REBEL FOR LOVE is due out worldwide April 29thworldwide. Follow BAAGHI on the official Facebook page to get updates.